Minor aches and pains can get in the way of you enjoying life. With CVS Health Extra Strength Acetaminophen Caplets, you'll get effective, rapid relief from a variety of pain-related symptoms. From pain caused by the common cold to backaches, toothaches, or muscle cramps, these caplets will help to relieve your pain. The active ingredient also temporarily reduces fever and works well for headaches, menstrual pain, and minor pain caused by arthritis. Take these tablets as needed to get fast relief for minor aches and pains. The package includes a child-resistant cap and it should always be kept out of the reach of children. 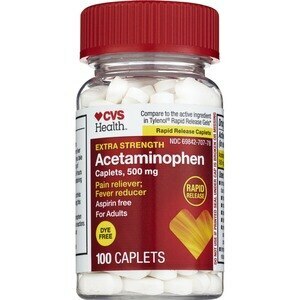 The ingredient acetaminophen relieves your pain by talking to the part of the brain that receives pain signals. The result is temporary relief from a wide range of pain-related symptoms. This medication is specially made for dealing with minor pain and should not be used for chronic, reoccurring pain or acute pain. These could be sings of a serious condition. Keep out of reach of children. Overdose warning: In case of overdose, get medical help or contact a poison control center right away (1-800-222-1222). Quick medical attention is critical for adults as well as for children even if you do not notice any signs or symptoms.